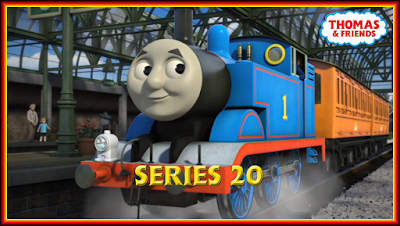 Series 20 has come to a close. Which means it's time to reflect, give the series one last look over and see how it stacks up. The episodes will be covered in order from worst to best, not by air/release date. This won't go into any major detail like the reviews. If you wish to read my full thoughts, click on the episode header of the review you want to read. I've done lists in the past of my favourite and least favourite episodes of the show (they will be updated eventually). While this would make the worst list, it also receives the dubious "honour" of being my most disappointing episode ever. Yes, I was disappointed with Rocky Rescue, but that was more with the writers; the characters were fine up to that point, but I needed more to fully care about them. With that being a disaster, I pretty much gave up on them completely, and their appearance in an episode further up the list pretty much affirmed my apathy towards them. This episode had Thomas, Percy and Toby, one of the best dynamics the franchise had back in the day, and for them to be written this poorly by a writer who's shown he cares so much about the show's past? That's why it's so disappointing. It doesn't help that the story is written solely for these "characters", the only good ones are undermined by the stupidity of the others and the sound mixing just adds to the contrivances. Oh, and Trevor's appearance is completely wasted. This, however, is flat out awful. The story idea was played out enough before, but there were (and still are) ways for it to play out in interesting ways. This is not one of those. Instead, we get the engines dog piling on a character that a) didn't deserve it and b) doesn't have enough of a character for viewers to fully care. If anything, it's more frustrating to see characters that we all (should) know act this way yet again. Hugo would eventually turn things around, sort of, in his second episode, but there were much better ways to handle this particular conflict. Have a few characters defend him would be one fix. Another would be, like I said in the review, have him be a rival for Daisy. But... nope. I can understand the appeal of Samson; he actually has character. But this episode made it clear that there's only so far you can go with this sort of character without it getting dull or one note. Actually, this was apparent after Samson Sent for Scrap, but this affirmed it further. Speaking of one note characters..! Granted this led to better things, but having to sit through this to get to that is still incredibly frustrating. There's more to James than "I'm red, don't I look smart", and if those preaching "this is Railway Series-esque" actually read the books, they'd realise this. Hopefully the development continues next series, and James is actually given some depth to his character, but with a shoved down your throat lesson, no one to really play off of (until the last minute or two) and a story that was simply fine, this wasn't the best way to say goodbye to the old, one note James. Fun fact: I reviewed this episode two weeks ago, yet when it came to compiling the scores for this overview, I'd completely forgotten about it. Since I've reviewed it so recently, there's not much more to add. It's great that Jerome and Judy will become regular sights from now on; I'll never understand why they replaced two cranes with one from series 11-19. But they're just not interesting enough to hold an episode on their own. The only thing that stopped it getting a lower score is that the theme was probably one of the best of this series. It's a moral that transcends generations, and one that should be heeded. It's easy to run when times get tough, but you have to keep in mind who you'll be leaving behind and you need to tell them where you're going so they don't worry about you. This episode is really entertaining... for about a third of it. Like I said in the recent review though, the rest of it is a total mess. Also, if you've got no roles for characters as limited as Flynn and Belle, don't use them. Actually, take the cannons off Belle and she could be a major asset for the railway. It's been said by a lot of people since she was introduced, but an engine of that design, and a character with untapped potential can do a lot if she's given the chance. With so many plot threads given so little development while characters who add nothing got a baffling amount of time, you can only see this as a bad episode salvaged slightly by a third(?) sub-plot involving the Fat Controller. 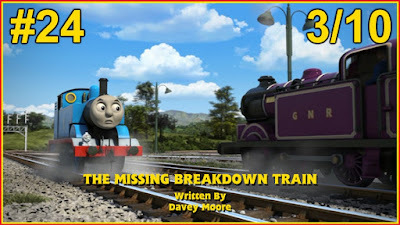 The Missing Breakdown Train had a boring story and characters and a great theme. This had great characters and an atrocious theme. I've already explained why, including one of the most recent, extreme examples to make my point. But even if we're talking about more mundane bullies or troublemakers, it's still a pretty bad theme only believed by those who've had very little interactions with those who behave this way. 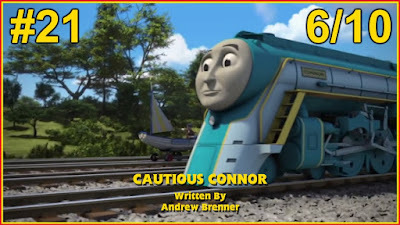 This could easily have been avoided too had Thomas actually been given more proactive advice later, but they still felt the need to push a theme that the episode itself showed didn't work. Don't get me wrong, the Pack returning was great, it was entertaining enough and the characters were fine. Even the moral Thomas learned at the end was great. But you know me enough by now; it takes more than that to make a great episode, and the terrible theme held it back completely. The theme is good, the story is OK, but Connor's character isn't really strong enough to fully care and the theme, while good, has been done better in the past due to other characters getting through their problems through sheer self belief and determination. Also, the joke with Stephen and the Eye of the Tiger adapted score was great, but probably would've been funnier had Over the Hill not been seen first. It all feels like there was very little attempt to make anything feel fresh. I'll say it again: just watch Edward's Exploit and Gallant Old Engine. You care a lot more about what's happening and you learn a more personal lesson than "friends will be there to help when you're down" which is, again, fine, especially since Stephen put Connor straight. 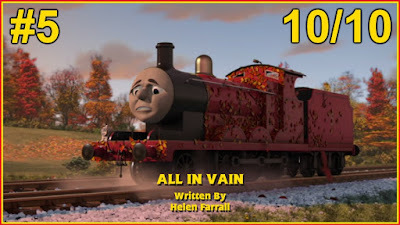 It says a lot about the quality of series 17 when a 7/10, written by Helen Farrall no less, barely makes number 20. It's not even a bad episode either, it's just not as good as other episodes this series, or as good as ones she'd written before and since. 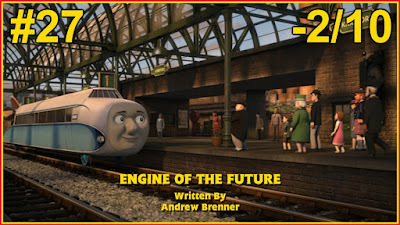 I still believe that its biggest issue is an overused trope of "thinking an engine will be scrapped". This was one of its better uses, but considering it was last used in the last series, I feel this is one trope that needs to be either rested or only utilised when new characters are the ones worrying about their own fates while older ones assure them things will be fine. But overall, this episode still has a really strong charm to it. It feels like a Christopher Awdry story, only without the pace destroying descriptions of every single aspect of an engine or the railway. It was also brilliant to see Glynn back, but the best was yet to come for him..! Speaking of charming, that's honestly the perfect word to describe Philip during this series. They've finally nailed his childlike persona (that was actually improved during The Great Race) and this story was a great way to develop it further. Granted it still has a few kinks; not realising Toby was a steam tram was a pretty big one. At least when Bridget thought he was electric, it was the first time she saw him. Also, some could still see him as pretty annoying, especially with the ending. But the theme was great, one that was relevant for Philip and one that, again, transcends its target audience. The only reason it's this low is, again, the overall quality of the rest of the series. Considering all the things I'd said about Hugo before this review went live, a lot of fans were surprised that I gave this such a positive review. Honestly, I was surprised when I saw the episode again for review that I liked it so much. Maybe it's because I watched it a few months after the Hugo hype and could watch it with fresh eyes, maybe it's because I'd originally overblown its flaws. It still has flaws, absolutely - the pacing isn't great, a couple of the main characters are still a bit stupid. But this is just really sweet and charming, and they actually used Hugo's self confidence issues really well. The theme was superb; much better than simply saying "be yourself", it actually feels like motivation to better yourself by using what you have as an advantage rather than sticking with what you have and going no further. It may be low down the list at number 18, but it's an episode that really should not be overlooked. 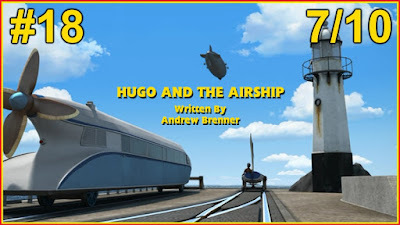 I just hope they use this episode as a jumping off point to give Hugo some development. It would be a shame if they didn't. This was a great way to start the series, and one that was unexpectedly good since it was released mere months after Finding Dory, a story that had a similar character type in the starring role. But unlike the Pixar film (love you Pixar, but I have to say it) which never piqued my interest whatsoever since it felt like a retelling of the first film while hammering in the theme of living with disabilities even further, this was much more subtle in its approach. Also, unlike Finding Dory, this led on from a previous project (one that was 3 years old, which was odd, but better late than never, I suppose) really well, rather than copying it near beat for beat. Sidney's motivations are understandable and you care about him following through with them. It's rather repetitive, but unlike other episodes where it's annoying as hell or the repetition is just... there, this time it was meshed into the story and theme really well. It feels like an episode from the previous era, only much better thought out as a story, it fits the characters better, doesn't talk down to its audience and is rather entertaining. On the whole, it still holds up, even though there were better episodes released down the line. It was simply a nice, charming way to kick off the series. Daisy has been an absolute delight this series. She's been the highlight of every episode she's been in, and while this is the weakest of the ones she starred in, it's still pretty great. That said, there's not much more add. I love the quintessential British vibe from it, I love the development, I love the subtle moral, but that Misty Island jibe is beyond a joke. It's obvious they're only there to appease older fans; younger ones of that era have probably grown up and out of the show by now. It's been 5 years now; enough's enough. 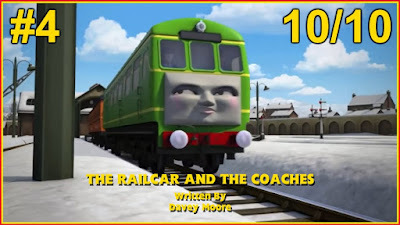 I'm going to take this opinion to my extra small grave: this episode has the best theme of the entire show, and it makes Diesel a much more complex, endearing character. And the best thing about it is something fans seemingly refuse to understand or care about: this softer side didn't come from nowhere. It was meant to build from Diesel's Ghostly Christmas. and it did so brilliantly. "But The Great Race!" True, he was an antagonist there, but he was far from threatening and was, actually, borderline goofy. Besides which, he's never been threatening, just really devious, which is two completely different things. Also, because the writing was so poor, he never followed up on his final failure and ended the special on a funny gag during the credits. So to act like he was villainous at all is a bit silly. If anything, Thomas is more of a villainous antagonist than Diesel has ever been with the emotional blackmail. That's not to say I don't like that though; if anything it makes the theme and lesson stronger. Think about it: Thomas is the character that kids gravitate to the most, and having him learn that means it will resonate with kids better than it would with other characters. Overall, I adore this episode. 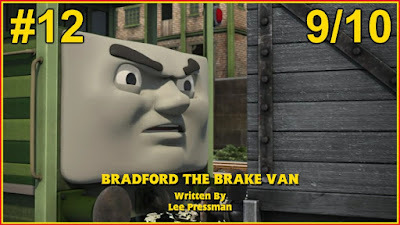 It's incredibly underrated by fans who'd rather keep the status quo and it showcases a side to Diesel that has naturally developed and shows that even the toughest, gruffest characters have a different side to them. Maybe if people actually talked to each other, rather than believe what they wanted to by watching "adult" TV (that's prone to stereotypes) and media reports producing negative stories about groups that are ostracised enough, the world would be a much happier place to live in. Like quite a few episodes, this one's tough to add anything to since I've only recently reviewed it. But to re-iterate what I said there: it's gimmicky, but great. It's probably the best gimmicky episode of the show. What makes it though is Henry. Considering how terribly he's been written since series 8 (except for series 17 that gave us a fantastic version of the character that they should've kept), it's hard to believe he'd be a great character again, but after the development from The Beast of Sodor he's really shone. Granted, his first episode is further down the list, but he was fantastic too. Turning the fear against other characters was great... to an extent (I still think some characters not being scared before Henry showed up would've been better). Sure, Thomas and Edward gave James a dirty look in one shot, but they revert to being scared later, so that scene felt rather redundant, even if it was great. But overall it's really fun to watch. Henry's demons being buried is a relief, but I'm hoping they don't do a Percy and steadily back out of it, reverting him to series 8-19 status. 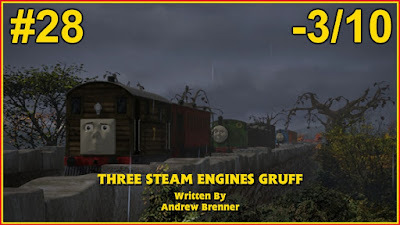 There was a whiff of this in Three Steam Engines Gruff, but Andrew Brenner hasn't been great at implementing developed characters into new stories, even if he's the one who originally developed the characters (Percy). There are so many charming episodes this series, this one included. 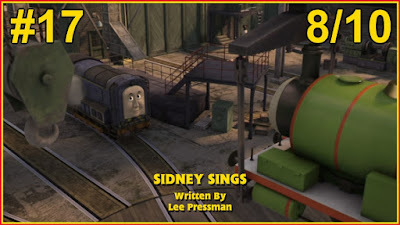 While this episodes has a similar theme to Sidney Sings (one good turn deserves another), I feel this one does it slightly better. Possibly because Percy and Harold have more of a history, possibly because the whole episode played on their dynamic rather than relying on one to carry the episode through to the end. Either way, it's another example of Helen Farrall completely nailing these characters and the dynamics. 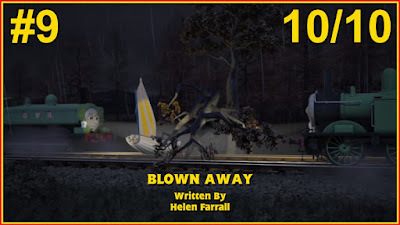 Now if she wrote a Thomas, Percy and Toby episode, that could be fantastic..! This also proved that the rescue team is rather pointless. Just bring the airfield back, put Harold back there and you're done. Because this was the best episode he's been in for years. This is the best festive episode since Last Train for Christmas. It makes you feel all warm inside and there's just so much heart and charm there. But it's not the best wintery episode, there's more of those to come..! From charming, heartwarming episode to flat out entertaining ones. Seriously, Bradford is one of the most entertaining, over the top characters of the show, and he's fantastic. The only real negatives are a) there's no real reason for him to be there and b) this is his only appearance so far. Also, the theme (rules are there for a reason) was great, but it was also nice that Bradford learned that some rules were a bit silly, something I feel extreme religious people should start to heed. Maybe if they did, many more people would actually respect their beliefs rather than turning people away. Overall, it's fantastic. With entertaining characters, a good story and great theme, it's hard to find any fault. Well, not impossible: it's really contrived, but that's not a huge problem since everything else makes up for it. Just missing the top 10 is this little gem. It's amazing how Glynn can go from the least interesting, pointless character of the show to one of the most laid back, fun characters. Although that could be due to the fact they paired him with one of the most charismatic characters of the show. Their dynamic is hilarious, and the fact they ended up forging a bond over their separate histories and making jokes at the expense of the two biggest egos on the railway. I still maintain that making Stephen jealous was fantastic as well. Because unlike the main characters, Stephen has never had anyone threaten his position before, and it's great that they'll eventually be working around the Earl's estate in the future (if that railway museum is still in the pipeline). 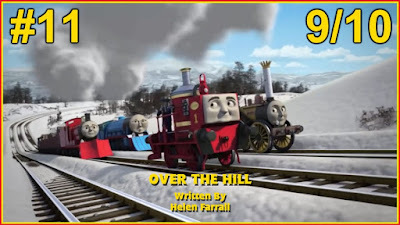 It's a bit of a shame that things took a while to get going, but it's a fantastic way to give Glynn some character, develop Stephen and it was one of the most entertaining race themed episodes since The Tortoise and the Hare. And so we've reached the top 10, and considering the scores are all the same, it was very difficult to order them. Well, mostly. These first three, however, were fairly easy. So, Useful Railway. It's fairly tricky to add anything here since I went through it so recently, but it just wasn't as interesting as other 10s or the other two adaptations. There were very few interactions and Thomas was at his most forced. But unlike an episode like The Flying Kipper, there was an actual story and theme, which were both great. And while the crash is the most notable thing about it, you were actually invested enough to get to that point, whereas the visuals in the other episode were the only thing trying to hold your attention. And with kids' attention spans being shorter now than they were, watching that episode could turn them off. So yeah, this episode is fantastic, but because there are better episodes, it has to settle with number ten. The first being the story. While it's fantastic, this is the third time in a couple of years that they went with it. Credit where it's due, they did what they could to make it feel original regardless, but the similarities are noticeable regardless. The second is the sheer ridiculousness and contrivance of that ending. It takes you out of the action slightly, and compared to the rest of series 20 (which feels incredibly grounded) it feels completely out of place. 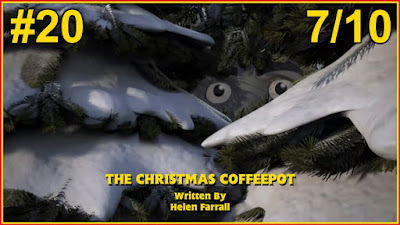 Overall though, it's yet another example of quality storytelling from Helen Farrall, and it only gets better for her from here. You know, the more I think about it, the more I realise that this did everything Pouty James tried to do, only much better. First off, Gordon was brilliant. Having so many characters to bounce off helped immeasurably and, as a result, his anger was absolutely hilarious rather than annoying or groan worthy. 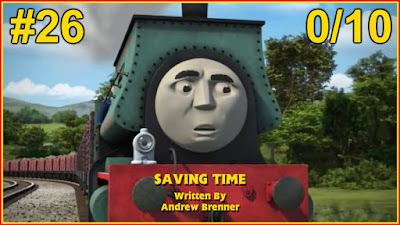 Besides which, this is the first time in a while where his position has been under threat, so his frustration actually meant more than James', who grumbles about "not getting suitable jobs" in so many episodes. The second, and most important, is Henry. His confidence was fantastic (I know he was nervous before, but it's understandable as he hasn't pulled the Express since... series 8?) and his one liners were brilliant. More of this Henry is very much welcome. This one really shouldn't be forgotten about, especially by the writers. It's funny, it has charm, it has a decent lesson about doing as you're told. In any other series, it'd probably be in the top 3, or at least the top 5. Ah, the theme of teamwork. These days, it feels like this theme is trotted out whenever the team run out of ideas. But this was one of those occasions where the lesson actually makes sense, feeling more organic and heartfelt than it has done for years. That's all down to the fantastic chemistry that Ryan and Daisy have. Her flirtatious attitude (you can try and deny it, but that's what she's doing here) was brilliant, as was Ryan's naivety. It would've been nice if he'd have been overconfident as had been planned in one of the draft scripts for Sodor's Legend of the Lost Treasure but then you'd have two similar personalities playing off each other, which isn't that compelling, and the tweaks worked out for the better... at least this series. I was also rather disappointed when I first learned that Daisy was being moved from the Ffarquhar branch to Harwick, but now I'm delighted they did. In hindsight, she felt rather overshadowed on the Ffarquhar branch. Most stories went to Thomas, Percy or Toby while she given a small mention or left out completely (and don't get me started on the TV version of Mavis..!). Now though, she's really been allowed to shine in her own right. It's lovely that that both characters learned something. With Daisy learning not to take advantage and Ryan learning to stand up for himself a bit more, it will make them a much more effective team. It's a fantastic episode overall, and I'd love for them to have another episode together. Maybe include a couple of other characters in to throw spanners in the works? The Little Western does have a great variety of characters to work with, after all! And now we come to the "most entertaining episodes" portion of the overview. This one is the lowest one solely because it was the least entertaining of the four and the story isn't that original in terms of the show (even if this was, technically, written first). 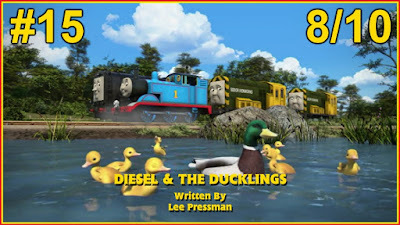 Thomas and Duck were brilliant in their roles, the engine/crew interactions were fantastic (especially Duck and his driver's since it meant that it could lead to more of the like in the future. I hope..!) and, although the pace was slow in areas, they did a great job to put in as much entertainment as they could. It had a good theme, the small engines were superb and... yeah, it's hard to find fault with. It's only missed out on the top 5 solely down to the slower pace and unoriginal story idea (again, even if this was technically written first). 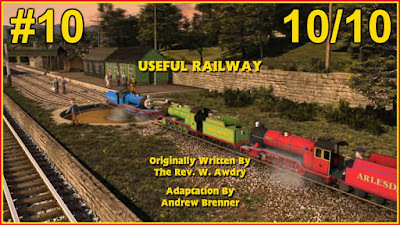 It's a borderline miracle, especially after Pouty James, that an episode starring the red engine would make the top 10, let alone the top 5. But that's the power of Helen Farrall's brilliant storytelling, and actually bothering to follow up on previous development that other writers started. It's tough to talk about without repeating myself from a week or two ago, but James' steady mental breakdown trying not to worry about small stuff while working his wheels to the spokes (that's the best locomotive variation of that analogy I can think of, take it or leave it) was really funny, as was his reaction to the scratch. It also made sense since dirt is easy, and more common, to deal with and scratches are rarer. It also made me want more of Edward and James' dynamic. Considering their most notable combination was 31 years ago in Old Iron, it's really fresh, it's incredibly entertaining (so long as Edward is kept this way and James gets annoyed at more than besmirching his livery) and they play off each other wonderfully. The theme, unlike Mucking About's which was far too broad and could lead to worse problems down the road, was fantastic, James was rewarded properly for his hard work, the special job actually felt special, and it was entertaining. Although it did make it clear that James is incredibly oversized and really should be shrunk down to Edward's size. Speaking of someone understanding characters well, Davey Moore is brilliant with returning characters. There are two shining examples further on and, as much as Mucking About's theme is awful, the characters are fantastic. But Daisy was also absolutely sublime, and this remains her best outing (only just though; Ryan & Daisy was fantastic as well). Putting her on Thomas' branch for the winter was great (although it would've been nice if Toby and Percy were there too), playing up her rivalry with Annie and Clarabel from back in the day was fantastic and putting her with the coaches as a punishment was genius, and still as entertaining now as it was then. Annie and Clarabel were fantastic too. It's nice that they've learned a few tricks from Thomas, and them learning that two wrongs don't make a right was pretty good. It's an alright theme, but here it worked great since Daisy was only being cocky and their teasing caused more harm than good. It also helped that the coaches got a really hilarious punishment for causing their own trouble. It's all really great, it's entertaining, Daisy's breakdown was brilliant and the ending will never get old. The final episode that's full-on entertaining throughout, and it's definitely the best one of the three. Like I said, the story's fairly stock (especially for Helen Farrall) and there no real theme. But it's just under 9 minutes of unabashed, shameless fun with two great characters and it worked to perfection. 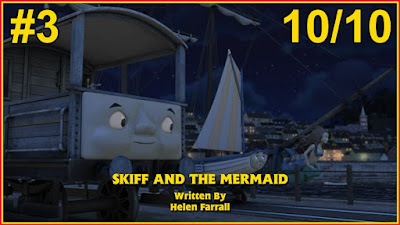 The Fat Controller was at his comedic best, especially with the Cast Away parody/reference, Skiff was as charming as ever, the direction really helped with the comedy and ending, while anti-climatic wasn't too bad. There's not much more to say, it's nearly 9 minutes of fun that I heartily recommend. They always say "leave the best for last", but for the small railway adaptations, they threw that saying out of the window and showed the best one first. To be fair,they were only following the order they were written in the books, but still. Again, the theme was "two wrongs don't make a right", but here it worked just as well since Bert misunderstood the situation and he got the proper punishment for it. Also, both parties apologised for what happened, so it felt different enough from The Railcar and the Coaches, even though the basic theme was the same. Also, the first act was great. As I say, making it all about the clergymen was a smart move, and their interactions with Thomas were great. Especially since he felt incredibly fussy here. Sone could say selfish, which is hard to argue against, but it felt like classic Thomas either way, unlike The Great Race where he was just being ridiculous. This episode isn't perfect, but it's entertaining, the story is great and the theme is fantastic. Any other series, it probably would've been number one. But this series, there's one more that tops it..! This is not only the best episodes of this series, but by far one of the best of the entire show. I thought that when it was first released, but after nine months I still believe that's the case. Heck, I believe that more so. The theme makes this a very personal episode to me. While I won't go into details, my brother and I had a huge conflict between then and now - it's one that hasn't really resolved itself; instead it's been swept under the rug. But at the end of the day, I know that he'll be there for me, and I'll be there for him. Yes, the comparisons to Twin Trouble are understandable, but the lesson means more here since the twins resolve their problems themselves rather than needing Duck there to metaphorically hold their hand through the making up process. There are a couple of niggles I have with it, but at the end of the day, they're not worth mentioning. 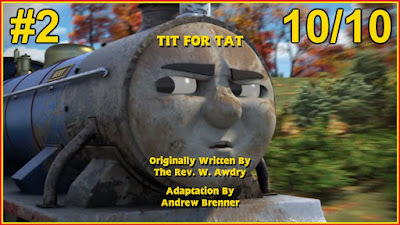 This is a near perfect episode, well deserving of its number 1 spot, and is the only episode (so far) worthy of challenging Edward's Exploit for the title of my favourite episode ever. Although we didn't know it at the start of the series, Arc would go bankrupt halfway through, eventually being bought out by Jam Filled Productions, with the studio being re-named Jam Filled Toronto. And no, it's not because they had so much to do for the franchise (although we don't know how much money Mattel gives them compared to how much work they've produced since they took over from Nitrogen), but because they were also working on a separate project, Blazing Samurai, and simply ran out of money, shutting up shop for just under a month. Unfortunately, you can honestly tell that this is the case from Mucking About onward. While the general look was still great from then on, ground textures are of much lower quality due to the lack of actual grass. It's obvious they had to cut corners so that they could release episodes with as little disruption as possible. But it's still fairly noticeable, and... as disrespectful as this may sound, the general audience won't know about the behind the scenes problems, nor will they care; they'll just notice that the grass doesn't look as good as it did. That said, even with all these problems, the team did a brilliant job making the series look as good as they possibly could. The rendering was great (besides the aforementioned money problems), the sweeping shots were superb and it was all edited together brilliantly. I'd say this was some of the best editing we've had since the show went CG, maybe even since series 2? The only real negative is that the scene changing whenever a character roller into it, causing a fade to black, was done far too much to the point where it became groan-worthy after a while. It would be nice if, next series, they found more interesting, unique ways to transition to a new scene. Now that their troubles are behind them, there's no excuses any more. On the whole, the voice acting has been great as per usual. 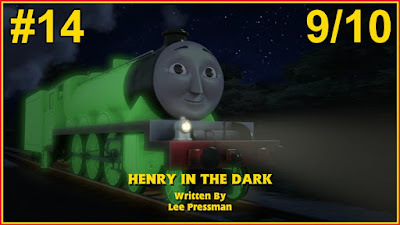 Henry's actually suits his personality now that it's developed (although his US voice is now worse) and Percy's just gets better the more Nigel Pilkington settles into the role. 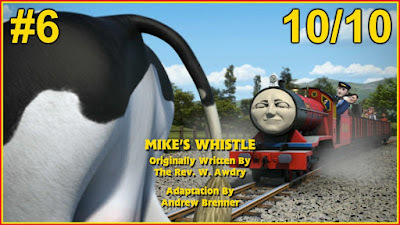 Speaking of Nigel, he was chosen to voice Trevor. He voices the character really well; it's just a shame that Trevor does, and says, very little. Maybe if they developed Edward's branch and gave him an episode with Edward or, maybe, BoCo? Heck, even Donald and/or Douglas would be interesting. 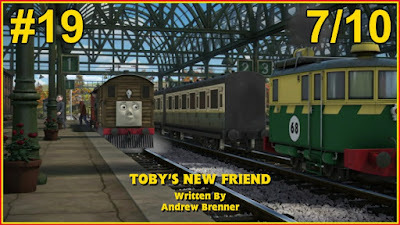 Or... or... another episode with him, Bertie and Terence? They are bringing the tractor back soon..! John Hasler followed in the footsteps of Ben Small and took over his role as Rheneas and he was brilliant. It was a bit odd since Ben's voice is more recognisable, and it would be nice for Rheneas to get more roles so that John can get more experience with the character, but he did really well for the small role he had. The best new addition this series though? Tracy Ann Oberman as Daisy. Say what you want about Sharon Miller's writing (and she gets criticism and ridicule from all sides for that), but as a voice director, she's absolutely brilliant. Couple that with an actress who just gets the character's obnoxious attitude and you've captured lightning in a bottle. But the MVP was definitely Rob Rackstraw, who's fast becoming the go to actor since he was brought in during Lost Treasure and series 19. His voice for Monty (US), Donald (even if I think Joe Mills should've voiced both like he did in the aforementioned special), Hugo, Bradford, the Thin Clergyman and the Small Controller were all brilliant, as were his performances for characters he'd voiced before. He may be a bit overused, but you can't deny that he's really good at his job. He has a fantastic range, and it seems he'll be brilliant as James when he takes over from Keith Wickham from Journey Beyond Sodor onward. On the other hand, Max and Monty's UK voices are awful. While Rasmus Hardiker is a brilliant Philip, he just does not fit Monty at all. As for Tim Whitnall? He has so little range as it is, but Max is probably his worst voice yet. You'd expect them to sound really gruff, yet both sound so generic, and it's a crying shame. Another huge shame is that Robert and Peter Hartshorne's contract with the show wasn't renewed after Lost Treasure, although it's fantastic that they won an award for their work on said special as it was, by far, their best work for the franchise (although Peter's re-working of classic themes for The Adventure Begins was amazing). His other tunes were great as well. It was nice that he used the Hartshornes' style as inspiration so as to provide a natural transition between the two, and they all suit the situations really well. Fingers crossed he evolves to carve his own path in the future; he could definitely become one of the greats if he does. This is, by far, the best series of the show this century (so far). While there were a couple of stinkers, there were far more episodes that were good-outstanding. Love Me Tender is definitely a standout for being the best written, best paced episode with a wonderful theme and amazing characters, the overall quality of each of these three aspects were far beyond anything we've seen since series 2, if not ever in some cases. Do I think it's better than series 2 though? No, begrudgingly. While yes, this series got more perfect scoring episodes than any other, series 2 had something that was just as, if not more, important: consistent quality throughout. There's not one bad episode that I can think of from that series (a couple of questionable moments, but they don't ruin the overall product), whereas this has 7 that are either bad or terrible - one of which having the worst, borderline toxic, themes of the show. So overall, series 20 is definitely one of the best ever, fitting snugly into second place behind series 2. Now we look to the future, and see what series 21, Journey Beyond Sodor and the Big World, Big Adventures reboot (yes, reboot, not spin-off) bring. Here's hoping it's more of the same, maybe even better, quality that this series provided.